The employment outlook for health information technology (health IT) is extremely positive—the U.S. Department of Labor’s Bureau of Labor Statistics predicts an employment increase of 20 percent for all health information professionals between 2016 and 2026. Over the last decade, new technology and regulations have changed the health information field dramatically. And as a result, it is growing fast. 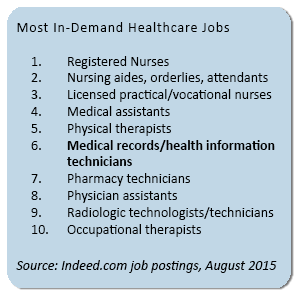 In 2015, CNBC reported that both health and technology jobs were in high demand and listed medical records and health information professionals as the sixth “most in-demand healthcare job”. The supply of HIT talent fails to meet the industry’s growing demand—an increasingly serious and limiting issue for organizations looking to harness HIT’s power and innovate while also looking to ensure the security of patient data and adhere to privacy regulations. Though recruiters are forced to look outside healthcare for IT talent, health IT professionals are preferred for the positions due to their understanding of complex rules and requirements for medical data. The 2015 HIMSS Compensation Survey reported that the average health IT salary in a sample of 1,900 professionals was $111,387, with a median salary of $90,000. A 2015 HealthITJobs.com salary survey of 700 health information technology career professionals reported an average salary of $87,443 and a median salary of $80,000. In 2015, health information technology professionals with less than two years of health IT experience made $62,780, in contrast to those with more than 21 years of experience who made $122,663. Also, those with health information technology career experience earned an average of $22,716 more than those with the same amount of experience in other IT fields—showing that in healthcare, health IT knowledge and skills are much more valuable than a general IT background. A clinical systems analyst investigates and fixes problems with electronic medical record systems and is knowledgeable in programming languages, operating systems, and hardware of systems used at a particular healthcare organization. The average national salary for a clinical systems analyst is $76,674 on Glassdoor and $65,865 on PayScale. As part of the executive team, a chief information officer (CIO) is in charge of all patient information that passes through a healthcare organization. The CIO typically leads the internal IT department and determines what strategies and resources it needs to handle the growing amount of digital health data. In 2013, CIOs working in healthcare earned an average of $208,417, according to a survey from the College of Healthcare Information Management Executives. 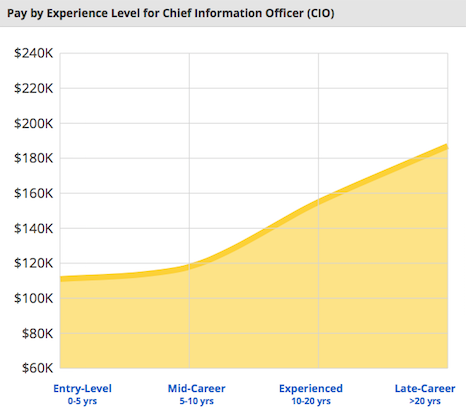 Data from Glassdoor and PayScale show an average national salary of nearly $150,000 for CIOs in any industry. In the UW HIMT program, students are required to take HIMT 490, the capstone course. Students find healthcare-related internship sites and set up semester-long projects in order to gain hands-on, real-world experience. Upon graduation, they are prepared for a variety of HIM and health information technology careers. View our capstone archive for a list of recent capstone projects completed by UW HIMT students. Searching for health information technology jobs? Below are links to several job banks where you can find health IT position openings. Interested in starting or advancing your health information technology career? University of Wisconsin offers an online Bachelor of Science in Health Information Management and Technology. Start your journey here. Questions about the UW degree program or HIMT field? Contact an adviser at 1-877-895-3276 or learn@uwex.edu.